As the Foundation’s US OPEN Celebration Show in Katy, Texas approaches, we have been seeking support from our Members. Rancho Madrigal has come through in an amazing way with the donation of two beautiful horses. Both of these mares come Registered with P.R.E. Mundial and ANCCE. These horses will be sold to benefit the Foundation initiatives including the show in Katy, TX. The first mare donated, Historica RM is a four year old Black Mare ready to breed and/or train your way. 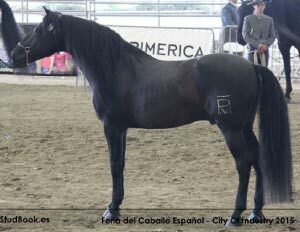 She is out of the talented black Madrigal Stallion Bohemio RM. As if to underline their generosity, the Madrigals have also donated Garbosa RM a five year old bay mare out of Casuco II a renowned stallion with Bocado, MIlitar and Urquijo lines. 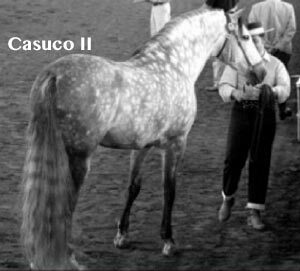 Casuco II 2010 is the Grand Champion Feria del Caballo Espanol and 2010 Champion of Functionality, Champion de la Raza. The Andalusian World Cup will be held in Las Vegas September 19-22, 2018. This is a major show in the west and you have the opportunity to deliver your farm message and get exposure for your horses through the Foundation Booth. We will be setting up on the 19th and actively promoting the Foundation Services, Breeders and Farms. Send us your brochures, photos, business cards, any informational or promotional material you have. There will also be a PowerPoint Presentation. Send your digital images with complete description to be included in the Digital Show. We will also distribute your materials at the US OPEN Celebration in Texas. Trip to Santiago de Compostela. The response to this trip has been excellent and exciting. Already the May 2019 trip has booked four travelers. Six others are waiting only for the exact dates to be announced to complete their booking with a $500 EU deposit. Full details of the itinerary, food, wines, horses and historic road have been posted to the website and can be found HERE. You can also access the Trip Info Page through the PREhorse.org Home Page. This new Trip is a March 2019 visit to fabulous Costa Rica. Travelers will attend the Costa Rica P.R.E. Show and make an in depth visit to the five most important P.R.E. Breeders in Costa Rica. The tour by bus will take in the vibrant Cloud Forest skirting the Arenal Volcano and National Park. Visit the waterfalls and, if you so desire, you can bask in the mineral laden hot springs. Please email info@prehorse.org to find out more or reserve your place. 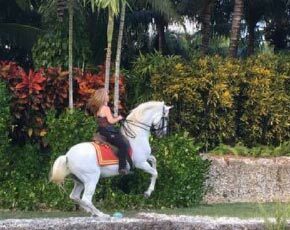 Imperial Andalusian's Mares Macarena and Elegida are featured in a newly released music video of the incredible tenor voice of GHALEB. The video was filmed in South Florida near Haulover Inlet. Be sure to watch to the end for the exciting finale! A a member of the Foundation, you can really help make the show a success even if you cannot attend. What to do? One thing is to Send Donations of any kind for the silent auction in Texas. We already have some premium items posted HERE. But as you know almost any item is welcome in a silent auction. ​Thanks to Barb Clark’s generosity and the detailed experience of Mary McCarthy, the Foundation Show Rules have been clarified and republished for the US OPEN Celebration Show to be held October 9-12. It was necessary to review and revise the 2012 P.R.E. Conformation and Functionality Competition’s Official Rules, in part because certain language of the 2012 Version was outdated in regard to the P.R.E. Registries of the world. As always, the Foundation for the Pure Spanish Horse strives to find ways to retain the Spanish Equestrian Traditions in today’s competition ring with minimal compromise to the authenticity, quality and history of these competitions for morphology and functionality. The rules changes are reflected in the Premium. The Rules, Premium and Entry Forms have been posted on the Foundation Website and are available for Review. CLICK HERE For LINKS. The illustrations will be forthcoming shortly. While Judge Mercedes Gonzalez Cort is in country, she will be performing limited Revisions at only two sites. On October 5th and 6th she will be at Chapel Creek Ranch in Sanger Texas, near Dallas/Fort Worth. If you are in that area you may want to take advantage of her services there. Judge Cort will also conducted limited Revisions at the show. 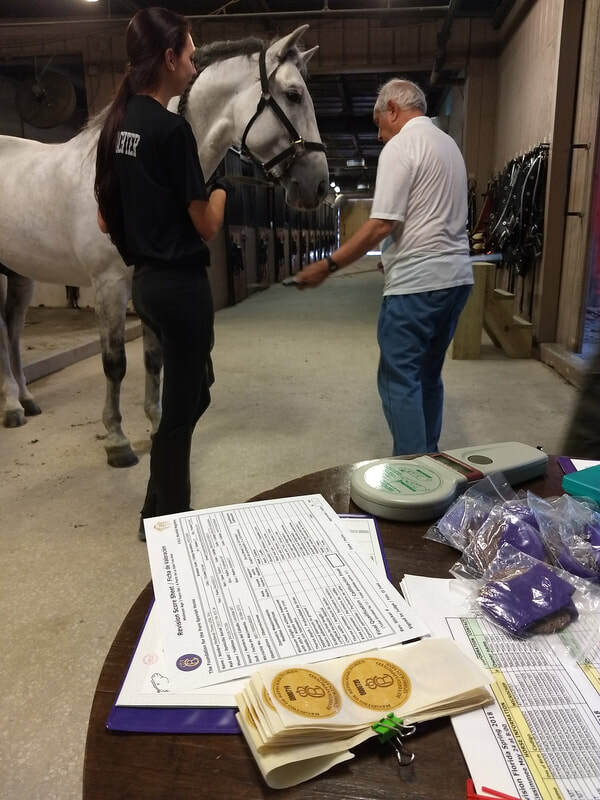 If you are interested in having your horses revised in October, please contact the Registry to make arrangements. Revisions at other sites are scheduled to be conducted in the Spring. Sites are chosen based upon demand. Six or more horses for either revision or inscription are needed to form a site. Owners with less horses can pay a premium to cover the cost of transporting and housing the judge. Call or email Barb Clark or the Foundation Office to take out an Ad in the Show Program, Arena Banner or become a Sponsor and support the success of the Show. Silver Star Ranch (Drs. Alan and Celia Stenfors-Dacre) - Class Sponsor Cobra of 3. The Iberian Connection (Bill and Diane Caulderon) - Class Sponsor Four Year Old Stallions. Mary McDonough /Absolute Best Movement. Mary Beth Klock Perez adds her support to the Rep Program for the Miami, Florida area. Mary Beth and her husband have owned and operated a unique Martial Arts Center called, Better Families Through Tae Kwon Do for over 28 years. It is a special place where people transform there lives and support each other's goals. The family lives on a 5 acre paradise, Imperial Andalusians, with beautiful P.R.E.s roaming the pastures. She is a long time supporter of the Foundation. Marnie Hoffman joins us for the Southern California / LA area. Marnie is a freelance animal trainer for film, television, entertainment and print work specializing in horses. She is also a manager and trainer at Oak Hill P.R.E.s in Agoura, California where she works alongside the head trainer. The Representative Program will be instrumental organizing on-going educational efforts through Clinics and Seminars. WELCOME and THANK YOU to Mary Beth and Marnie! We look forward to more joining us soon! Volunteer HERE! Don’t forget to participate in the Summer Fundraiser. Whether it is $5 or $500 or more, any amount helps us in our continued efforts on behalf of our Magnificent Breed. 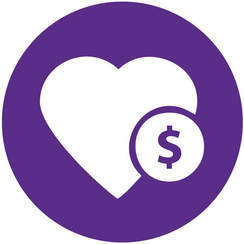 ​CLICK HERE (https://www.prehorse.org/store/c7/Donate) to make a cash donation. Thank You! Promote Your Farm. If you want your farm listed on our web site, complete the Submit Breeder Info form at the bottom of the Resource Page. 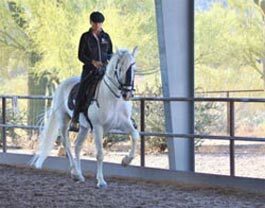 ​Riders in Albuquerque, NM will have the opportunity to attend a Manuel Trigo Clinic, Saturday and Sunday August 26 and 27th at Cherry Tree Farm. This clinic will be focused on Proof of Balance to include myofacial releases. You may participate in the clinic as a Rider, as an Active Auditor, or as a regular Auditor. Active Auditors will work in the arena, as assistants of the riders and more. Please see details at the link below. Pepa DE out of Dominante XXIX and Cortesana RS (Gaucho III ) owned by Ellen Birrell has been in training with Kim Elsner (previously assistant to Hilda Gureney) . Under Kim’s expert hands Pepa recently developed solid flying lead changes. It took Pepa a bit to decide that she could handle the maneuvers, but now – she is going happily and joyfully. It is clear from her self satisfied attitude that she is enjoying herself immensely. She is currently working at 4th level and will start Pre St. J next year. ​Seni Uranio II made his debut at the recent CDN Championship, CAVA - BARCELONA, held in Girona, ES. Ridden by Jesús Angel Moreno Gómez the young stallion was awarded GOLD MEDAL and 1st Place in the 4 year old horse division. About a dozen years ago, Martha Perkins adopted "Silfide" through a Foundation adoption program. Silfide turned out to be a wonderful animal and companion, but Martha is 87+ and finding that the physical demands of caring for her are becoming increasingly difficult. That however is not her major concern. She is worried that if the matter is left to chance, and she should become incapacitated (or die), there is a possibility this gem of a mare (because of her deformed foot) could be sent to slaughter. Martha is willing to contribute to Silfide's care on a monthly basis if a satisfactory home can be found for her. As you can see from the video, Silfide doesn't let her handicap inhibit her much! !